About a month ago I was driving home from visiting Kayla. There’s a tiny little town called Lamont that has a little antique shop. Well Kalissa was with me and we stopped. I ended up spending $38 for this shelf. I’ve been needing something for childcare toys. I’ve not liked what I had. I wanted something antique/old looking. This, I thought, would be perfect. I did have a few things I didn’t love. She the white smudges on the center of the shelves? Check out the photo below….Paint drips. 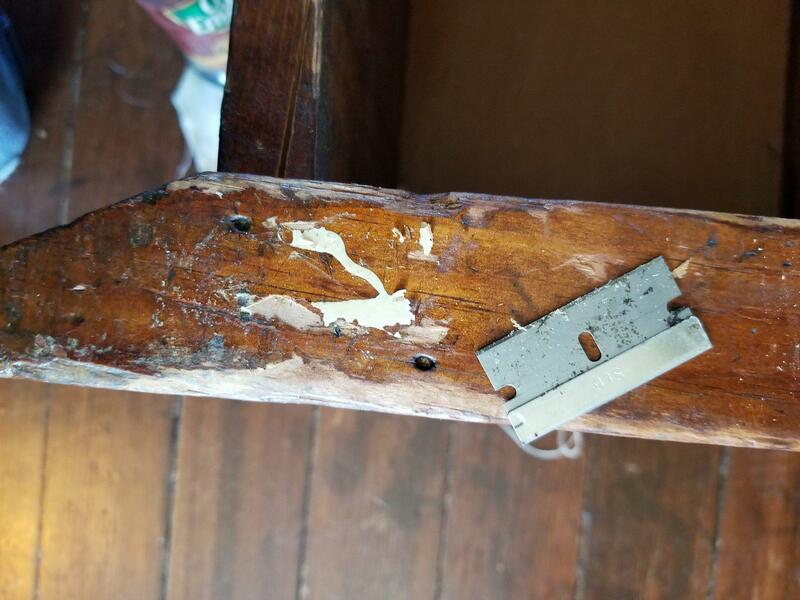 So time to fix it up….I wanted an old worn look so decided a razor blade might do the trick on paint removal. I didn’t want to lose the finish on the wood so no chemical removers. This entry was posted in antiquing, Uncategorized, Vintage and Antiques, Vintage Things on May 2, 2018 by Jo. Have you noticed that lots of my stash reports have turned into thrift store reports? I’ve notice that but then again, most of the fabric I buy comes from thrift stores. Kalissa and I went on Saturday to check out the thrift stores…She doesn’t mind thrift stores but she’s not SUPER crazy about them like I am-but then again, few people are as crazy as I am about thrift stores. The leaf and gingham are cotton but the other two you can see aren’t. Typically I only buy cotton but this time I bought these to pieces to cut down so I can make squares for clothes for my Woodkin dolls that the childcare kids play with. 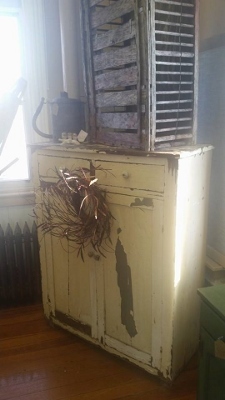 This entry was posted in Thrift Finds, Vintage and Antiques on August 20, 2017 by Jo. At our old house, I was able to use the “dining room” as my sewing room. You just had to walk through one small corner to get to the bathroom and there was a closet off of it, so it was perfect for storing my ever growing mass of “things.” When we moved however, it quickly became apparent that the dining room wasn’t going to be able to be my sewing room. It ends up with a lot more traffic through the middle of the room and there is a HUGE wonderful window on the one wall, so it leaves very little space for any cupboards or storage of my “things.” We have however worked it out so that I can have a small sewing table in the dining room so that I can still sew downstairs. I also have one cupboard to hold office/school supplies and a few projects that I am working on. Upstairs, however, is another story. There are 3 decent sized bedrooms with HUGE closets and then one smaller room that is kind of like a large glorified closet. The only problem is that the ceiling is quite sloped. Because of this, I don’t know how well we will be able to get shelving installed as there is only about of 4 feet of wall with full ceiling height. Or maybe I’ll be able to find a short one like this…. I think more than anything, I love to have a reason to go to auctions. 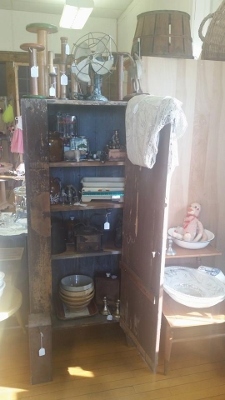 Finding a cupboard is just the goal I need! This entry was posted in Kelli, Uncategorized, Vintage and Antiques on April 13, 2015 by Kelli. I told you earlier in the week that Hubby kidnapped me. Day one, although we had fun and did find the bathroom mirror, was slim on the antique hunt. We did end up going to Cedar Rapids that evening and visited with our son Buck and his wife Jen. It was almost their anniversary…my a year can fly by. The next morning we were in Monticello, Iowa visiting our daughter Kayla and her husband Spencer. Both of our kids had bought houses and Hubby hadn’t seen either one of them. We just had a quick visit with Kayla as they had a full schedule that day and we were off antiquing. There’s a great shop in Monticello we always stop at, Whistle Tree…we didn’t find anything there. Their specialty seems to be furniture…which we LOVE! Next stop the old church in Cascade. We love their shop. We can’t resist stopping. We bought our kitchen chairs there and we bought my filing cabinet that was Hubby’s first refinishing project. They had lots of things to look at there but the owner was reorganizing the shop getting ready for fall so it was a bit of a challenge to get through. I always have an eye open for quilts!! The bottom one didn’t appear to be vintage at all….but I still liked it. I’ve seen something like this done before…I want to make one someday…I think I might revamp it and do it with half square triangles. Here was a nice quilt. I seem to be drawn to quilts without a lot of whites in them lately…Loved this one! This was wool and I loved it. Kayla had made something similar once. I grabbed a close up of the stitching if she (or any of you) would ever want to replicate it. I could easily find wool jackets at the thrift stores for it! We didn’t buy anything there and continued on our way…a trip to Lowes in Dubuque and then on to Cuba City, Wisconsin….complete with a stop in Hazel Green. The Hazel Green store is going out of business so nothing was new there…at Cuba City…we found this…. I had heard of this place via Craig’s List. I had been begging to go…Hubby ignored my pleas. Well he won’t ignore me again. WE LOVED IT!! It is huge and perfect for antique lovers and house restoration people. I was so in awe that I forgot to take many pictures. In the front is a show room of nice antiques. There were probably 5 tall high backed beds. All were beautiful. In the next big room there were fire place mantels…probably 6 to choose from. All were displayed neatly and very organized. In the upstairs…they had a room of wood trim taken from houses. They had a room bigger than the main floor of my home FILLED with doors. All types and sizes you can imagine were displayed. This photo is half of one wall. Looking for a claw foot tub…look no more! There was a room of only lighting. There were lots of people there to help too. They are only open Fridays and Saturdays. But WOW…we ere so impressed! We did find a few things we were looking for…all in this bag are our “big” purchases. There are three double switch plates for push button light switches. We didn’t realize we would need as many double push button switches. The electrician put double switches in the bedrooms…one for the light and one for the fan. They had a triple switch there we probably should have bought but we know where they are now…at least we hope there are some there if we need them! We found glass knobs for the kitchen cupboards too. I am slow in antique malls because I am trolling the place for sewing or quilting things…Hubby in only looking for furniture or fire trucks. I knew he was already done looking and sitting out on a bench so I was especially trying to hurry…besides, both of us were hungry. I came around a corner fast and was going to quick peak in a room when I got so excited. I spotted my childhood doll. I have been wanting for a LONG time to find her…I was giddy. I got the rest of the way around the corner and imagine my shock when I realized she had been beheaded!! I came out of the store shaking my head trying to get the image of my beloved childhood doll beheaded when Hubby asked what was wrong. I explained the whole thing to him and we both ended up laughing and laughing. All in all a good trip. On the way home we stopped and visited Hubby’s niece and we stopped at Kelli’s house too. I was good to be gone but as always it’s good to be home too. 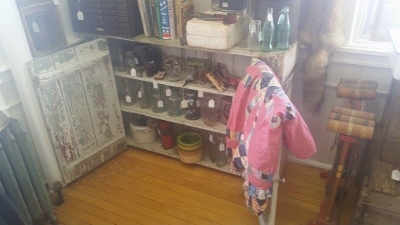 This entry was posted in Jo's Journal, New House, Thrift Finds, Vintage and Antiques, Vintage Things on August 9, 2014 by Jo.